At Foursquare, we have access to the world’s largest database of information on the foot traffic of people around the globe. This is a seriously powerful dataset, and every day it grows stronger, more accurate and more insightful about human behavior. Today, we’re excited to share a super interesting slice of data that we discovered this week. With all eyes on the brand new iPhones launching tomorrow, we were wondering if our foot traffic data could indicate how sales would do this weekend. So our Place Insights team looked into foot traffic at Apple stores leading up to the launch of the iPhone 5, 5S, and 6 and analyzed it alongside Apple’s public sales data. You can see how visits to Apple stores ebb and flow — foot traffic changes all the time due to routine cycles of seasons or days of week. 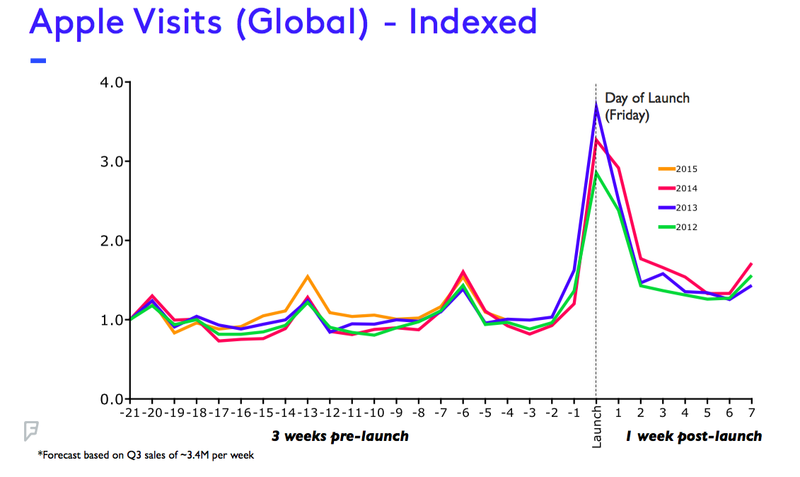 Foot traffic patterns also change around major holidays or launch events. Below is a chart of ‘visits’ to Apple stores over the last three years. In each case, we show visits in the three weeks preceding iPhone launch and one week after. For each launch, visits to the Apple stores spike in the week leading to launch day with a major spike on launch day and shortly thereafter. Over the last three years, foot traffic has increased by 200 to 300 percent on launch days over the average Friday. Looking at Apple earning reports from the same period, we can assess how launch weekend sales volumes perform versus normal weeks. In 2012, Apple reported sales of around 5 million units — an increase of around 140% over the normal weekly sales volumes that quarter. In 2013 and 2014, Apple sold around 9 and 10 million units, an increase of around 245% and 230% respectively. Based on these early indicators, Foursquare predicts that launch day foot traffic will be about 360% of a typical Friday. This likely means that Apple will sell 13–15 million iPhones this weekend, surpassing all previous records. As an important caveat: our visit data is only one factor in a mosaic around predicting sales. In the case of Apple, the Apple stores account for only a portion of sales, for instance. Phones are pre-ordered online, purchased through carriers, etc. Nonetheless, we believe this is the world’s best “panel” of global foot traffic, and is a strong enough sample size to be a strong indicator of sales overall. This is the first time we’ve used our data to predict sales, but it won’t be the last. Our Place Insights tool uses all of Foursquare’s data to offer business insights across a range of industries. The dataset is very compelling — over six years of data about the places people go every day — including more than 7 billion check-ins at over 65 million places. We have an additional level of insight through our Pilgrim technology, which gives us information beyond active check-ins. Using background location awareness, we’re able to accurately “snap-to-place” phones that stop for five minutes or more at one of these 65 million places. We can triangulate not only from GPS signals, but also all the nearby Wi-Fi access points, and Bluetooth beacons as well. Real estate: How can retailers and chain brands optimize site selection for their next location? What malls and shopping locations are on the rise, which are on the decline? Finance: What non-financial leading indicators exist to help financial companies and portfolio managers understand future stock movement? SMB Credit scoring: How can lenders to small business quickly confirm that a small storefront, bar, restaurant, salon, etc. is truly in business, and whether its relative foot traffic is rising over time? Marketing and sales: For beverage and liquor companies or other vendors and brands, what are the new restaurants, bars, or shops that certain demographics are flocking to, in any neighborhood in over 100 countries? As a note on privacy, Foursquare ensures that this trend data is always anonymous and de-identified. We only look at aggregate visits over time because we have complete dedication to the privacy of people who have opted in to our apps. Our priority is to use location to provide value to consumers, such as a ping to recommend the best dishes to order when you sit down at a restaurant for the first time, or advice from friends when turning the corner while traveling to a new neighborhood. This means we’re able to give an individual the most specific and personalized recommendations and pings that no one else sees, whereas our Place Insights business clients get the rolled up data in aggregate, revealing the fascinating trends of our culture as a whole.